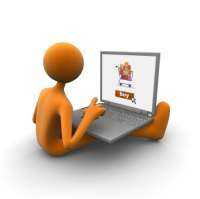 As a web developer we make money in 2 ways with domain names. We buy domain names on behalf of clients and add a service fee on top. Here in Australia we buy our .com.au domain names for $30 as a reseller for a registrar. We charge clients $100 for the domain name. Once you have a few clients it all adds up and can be some good money. Now whilst a $70 margin might seem a lot, the client gets great value. You see, we take care of everything. Clients aren’t buying a domain name. They’re buying a solution to the problem of them not knowing about domain names, how to register them and how they work. Remember, you’re hardly ever selling what you’re actually selling. Are there cheaper places to buy domain names? Of course. If the client wants the cheapest, then they’re not the sort of client we want. Something always has to come off when it gets cheaper. That’s almost always the service quality. To survive in business (and that means you can continue to help your clients) you need to be making a good profit. Good clients get this. Bad clients don’t. You don’t want clients who work against you in your pursuit of making a good profit.